In case you missed it, in honor of Pride 2018, we’re running a fundraiser in an effort to raise money for the Trevor Project. 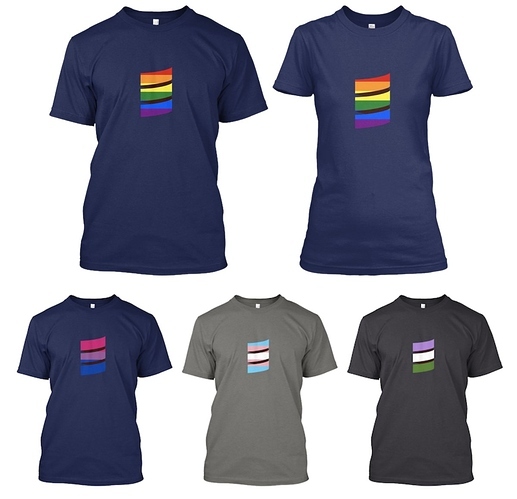 We created special Pride Scala swirls for just about every pride flag we could think of, and all are available as t-shirts on Teespring. Each swirl is available on many different shirt styles, and in many different colors. 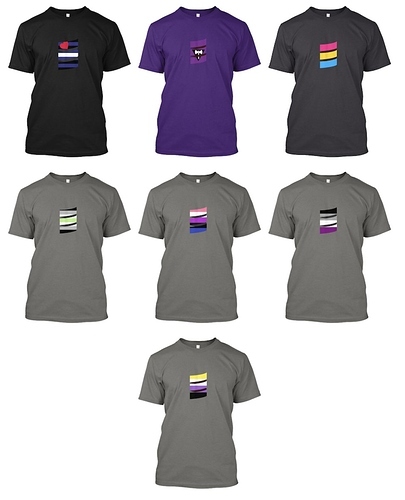 100% of proceeds for t-shirt sales are donated to the Trevor Project. It really aggravates me to see a programming language getting into a hotly debated social issue. Can’t Scala just be a language that everyone loves without becoming divisive? Could you clarify who is “we”? Thanks! What is the hotly contested social issue? Heather, you did a great thing. I’m buying my shirt and supporting the charity today. This isn’t the “language” doing anything, this is the community around the language working to make sure that it is open and accepting. It benefits a language to have a broad community. The more people who use Scala, the more it will grow. For that, we want to make sure that everyone is welcome in the community. Heather is doing a great job of this, IMO. Would you say that every disadvantaged minority should be entitled to create T-shirts with modified Scala swirls to sell for fundraising? LGBT Scala programmers like myself, and the LGBT youth benefited by the shirt sales, are not “divisive social issues”. We are human beings. I never thought i’d see the day where “Crisis prevention for suicidal youths” was considered a contentious issue. If it weren’t a hotly debated topic there’d be no need for “Pride 2018”. I’d simply prefer Scala and its community focus on doing what it does and staying out of social issues. Apparently, I’m the only one that thinks that, so I’ll drop it. Sure. Why not? I have a feeling that different groups will get more traction than others, but if someone in the community cares about a particular cause and takes the initiative the way Heather has, I certainly don’t have a problem with it. I can see a fear that the board would be saturated with them, but I can’t see that actually happening given that it takes a certain amount of effort to set up and I have a feeling that Scala developers have better things to do with their time than troll setting up shirt sales for things they don’t truly care about. Although I don’t support the sentiment of your question, I do appreciate that you raised the issue. Github changed the way we do software because it is “social coding.” That is not just a buzz word or slogan. Social coding is fundamentally different from computer science as “disinterested discourse”. I just saw that Github changed its terms of service and privacy statement, so maybe social coding will be blown to pieces after all. So I’m talking about social coding as it existed as of last week. I hope the Scala community continues to focus on doing what it does and does best. I am grateful for their efforts. As long as everyone is free to love any language they want it’s fine for me. If you can’t code in the one you love, honey, love the one you code in. I must admit that when I first saw this fundraiser, my reaction was, “what?”. I don’t care strongly one way or the other, but I agree with those who recommend steering clear of such contentious issues. While I agree fully that LGBT people should have equal rights and be treated with dignity, I also know that this issue has been abused for political purposes. It is one thing to “accept” people who practice “non-traditional” lifestyles; it is quite another to be forced to condone and “celebrate” those lifestyles. Look at the recent US Supreme Court decision, in which a gay couple attempted to coerce a Christian baker to design a gay wedding cake against his religious convictions. The Supreme Court rightly said that that is a violation of his civil rights. That just illustrates how a legitimate issue can be pushed too far and become contentious. Why is this contentious? We’re talking about our fellow humans and how people live, which they do not choose in this case. Open is part of Open Source. My feelings are not dictated by supreme court decision, but life experience. I bet 100% of folks on this or any boards, have no idea of the developers life, unless they know them personally. I salute Seth and his comments. The decision is very interesting reading. The state’s decision was overturned because the baker did not receive “neutral and respectful consideration” in his case; the dissenting opinion says this is not a compelling basis for reversal. In other words, because of how the case was handled by state officials, not based on the merits. The bit about whether decorating a cake is protected speech doesn’t figure into it, although a concurring opinion prefers to restate that aspect with emphasis. Also, it doesn’t matter whether his actions were protected under Colorado law as it existed back then, before marriage was universal. Otherwise, the law about equal access to public accommodations is pretty straightforward. The baker is taken to be “an expert baker and devout Christian.” I don’t know why it matters that he was devout. What if he was actually an inexpert Christian who hadn’t read scripture? A sinner and a schlump? I also don’t know why it matters that he was a good and not indifferent baker. People engage in expressive arts of all forms and at all levels. Speech doesn’t lose its protected status went it turns trite. There are laws governing hate speech but not trite speech. I learn something every Sunday I manage to get myself to church, though the acoustics make it difficult to hear the sermon from the choir, even when the pastor is literally preaching to us. I show up with my inadequate faith and partial knowledge. I also learn something from the Scala community whenever I drop in. And as at church, I try to keep up with my tithing and give back in the limited ways I am able. Open source is a really crazy idea, the way an open society is also a crazy idea that couldn’t possibly work. I get to listen to interesting ideas that go over my head without paying tuition for the privilege; and I am exposed to people who think differently from me, all the better for them; I enjoy watching their bold experiments and brave failures. Although the Supreme Court decision is narrow and technical, and doesn’t say what you represent it saying, it serves as a useful moment to reflect on how fundamental the openness of Open Source is to what may seem like merely narrow and technical efforts in software. I don’t see this fundraiser or the Scala Bridge project as somehow ancillary to Scala, but as expressive of it. LGBT issues along with race issues and the like are very emotional issues in which there is no middle ground. When you post something about such issues there will be problems. Some will be pro and some will be con and the two will never meet. I myself am 100% pro LGBT but I know for a fact that people that are anti LGBT will very much find this post annoying. Our minds are similar to a scala or java class. We can only embrace what was put into our minds during our lives. That is our reality. People that are anti-LGBT can only be anti-LGBT because that is what was put in their minds during their lives. Such people are probably also anti many other things. I am open to all things. That is because that is what was put into my mind during my life. For this reason, posts promoting something like LGBT , or better race relations will always be an issue with no middle ground. Contrary to widespread public misconception, the Christian baker involved in this case did not “refuse to serve gays.” (I realize you did not make that claim, but I am just setting the record straight for those who didn’t know that.) He was perfectly willing to sell them a wedding cake. He was just not willing to design one specifically for gay weddings. Since when is any producer required by law to provide a custom product on demand? Here is a question for brilliant legal minds. If a baker is required by law to provide a gay wedding cake, and a wedding photographer is required by law to work a gay wedding, how long will it be before churches are required by law to perform gay weddings – or be sued into bankruptcy? I urge you to think it through and decide whether that’s the kind of world you want to live in. The First Amendment is specifically designed to prevent such a world.